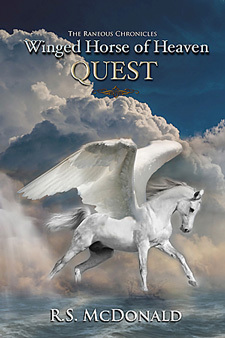 Book two of The Raneous Chronicles is Winged Horse of Heaven: Quest. At 190 pages it’s double the length of Fallen, book one, with double the excitement! Raneous returns to the Shadowlands and quickly learns that something evil is trying to take over the beautiful city of Livia, the capital of the Eastern Region. People are mysteriously disappearing, red eyed snakes and huge rats infest the city, and chaos reigns. Raneous is reunited with his trusted friend, Brian, and together with new friends, they set off on a quest for a lost brother named Sam, not knowing that they will be faced with the fight of their lives as they battle the evil forces over Livia. Only the High King can unravel the tangled web they find themselves in! “Once again RS McDonald brings us an exciting adventure that captures the hearts of all readers, young and old. Her characters embrace us, and you can’t help but love Raneous, the Winged Horse of Heaven, as he’s sent on another mission. It’s totally inspiring and a book you won’t want to put down.” Marggie Brown, Publisher of Hoofbeats Magazine.